The church is near the bottom left corner of this map. An interactive map is here. Food and drink: light refreshments (tea, coffee, cake etc.) will be available in the building all day Saturday and after the Sunday workshops; and each evening there is a bar. Alma Vale Road, which runs alongside All Saints, has a pub and a cafe. 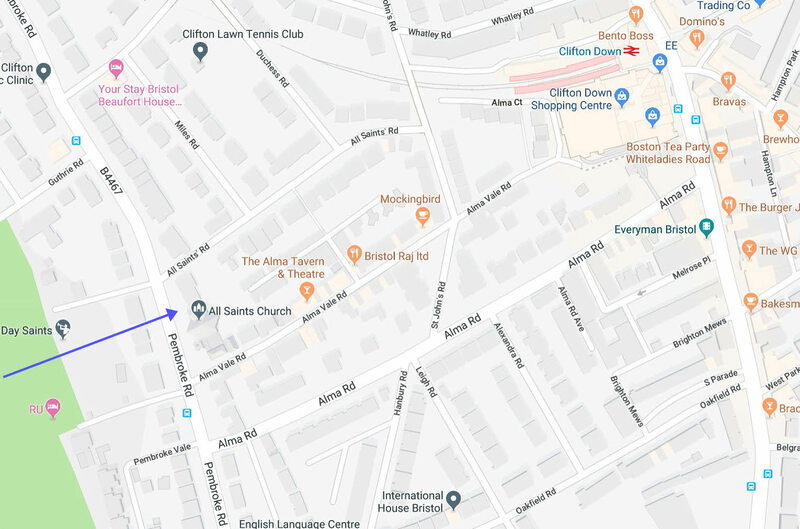 There are many cafes near the Clifton Down shopping centre: walk down Alma Vale Rd, turn left at a crossroads into St.John's Rd, and just after the railway bridge turn right and walk through the car park, past (or into) the pub. The other end of the car park takes you to the main road, shops and cafes. Parking on the street near All Saints is free after 5pm, and all day at weekends, though it may not be easy to find a space, and it would be wise to check the parking notices. There is a multi-storey car park at Clifton Down, entrance on Alma Road, just below where "Boston Tea Party Whiteladies Road" is marked on the map above. Bus No. 8 stops on Pembroke Road near All Saints; the stop is named Alma Vale. It connects with the city centre and Temple Meads station. It takes very roughly half an hour from Temple Meads, longer in heavy traffic. The bus goes round in a loop, so you get on at the same stop where you got off. Other buses go directly to the city centre from Whiteladies Road, which is the main road at the right-hand side of the map above. Trains from Temple Meads station to Avonmouth or Severn Beach stop at Clifton Down (near top right of the map). From there it is about 10 minutes walk to All Saints. The train takes about 15 minutes from Temple Meads to Clifton Down. Walking from Clifton Down station: there is a ramp up from Platform 1; turn left at the top, this takes you into a car park. Turn left again and walk through the car park to St. John's Road, where you turn left, and then take the first turning to the right, All Saints Road. At the end of the road, turn left.